In an exclusive interview with NBC’s Meet the Press, House Speaker John Boehner said there is no easy way to stop the budget cuts -- known as the “sequester” -- that began taking effect Friday night, and voiced uncertainty over how Washington can solve the overall fiscal problems that have consumed the nation’s politics for more than two years. In an exclusive interview on Meet the Press, House Speaker John Boehner weighs in the economic impact of the sequester and whether or not it will hurt the country's economy. “I don't think anyone quite understands how it gets resolved,” Boehner admitted in his interview with NBC’s David Gregory. Boehner explained his strategy in the Republicans’ tax-and-spending standoff with President Barack Obama, saying that he didn’t want to “arbitrarily pull out a couple of tax expenditures” just to raise the revenue needed to avert $85 billion in spending cuts which are being made this year. The president and many of his administration officials have warned of dire consequences to government services and national security if the sequester happens as planned. But to avoid them and reach a deal, the president wants new tax increases, something Boehner and his fellow Republicans have insisted are off the table. The spending cuts – which were intended to spur a bipartisan “grand bargain” on deficit reduction, entitlement reform and tax increases -- are part of the 2011 Budget Control Act which Obama signed into law. 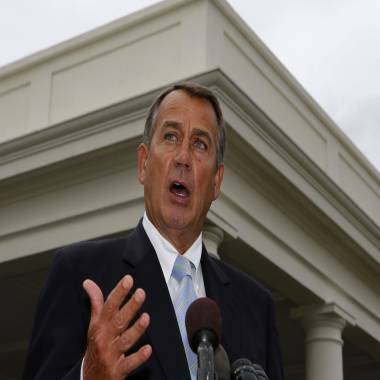 Boehner voted for the law and urged his members to do likewise. But now that the spending cuts are beginning, neither Boehner nor Obama wants them to continue. Yet they have been unable to reach an accord on an alternative measure. Speaker of the House John Boehner, R-Ohio, speaks briefly after a meeting with President Barack Obama at the White House March 1, 2013. Boehner insisted that Obama should abandon his effort to get more tax increases and instead focus on spending. Obama has insisted that any plan to replace the sequester must include new tax increases, for example by changing the tax treatment of corporate jets, and by ending tax preferences for oil and gas producers. Boehner did say that a comprehensive tax reform law would be a way to spark growth. That, in turn, would produce more tax revenue for the federal government. In an exclusive interview on Meet the Press, House Speaker John Boehner gives David Gregory the details of what went on for both sides during the sequester negotiations. Obama said Friday it may take some time before members of Congress agree to bargain with him on how to replace the spending cuts. He said, “It may take a couple of weeks. It may take a couple of months” before that happens, but in the meantime the spending cuts will dampen economic growth and hurt federal workers who are furloughed and federal contractors who lose work. Following Boehner on Meet the Press, Obama economic advisor Gene Sperling said Boehner ought to be willing to consider at least $400 billion more in tax revenue increases over the next ten years as part of a larger agreement on deficit reduction. Sperling said Obama has already agreed to require higher-income Medicare recipients to pay higher premiums for their coverage than they now pay and has agreed to change the formula for Social Security benefits, which would in effect reduce benefit increases over time. These were difficult concessions for Obama to make, Sperling said. But he argued that the spending reductions will “hurt a lot of communities that rely on military spending” and hurt public education. He noted that on Saturday Obama made phone calls to both Democratic and GOP senators to form a “caucus of common sense” and support an alternative to the spending cuts.